Here is the list of games that I found out for this entry, but I'm sure there are many more around. If you can throw in some names, perhaps even some links, they are certainly welcome. Latest edit: 30th of March, 2014. 1983 - Paratroopers (Rabbit Software, Commodore 64) - by unknown. 1992 - Paratroopers (Fine Young Cannibals, Commodore Plus/4) - by "Ratt"
The first known version of the game was made by Mark Allen for the Apple ][ computer in 1981, and released by On-Line Systems, later known as Sierra. All of the basic elements from the later, more well-known versions, are in the game already: your gun being stationary at the bottom of the screen, shooting helicopters, jets, paratroopers and bombs that drop from jets, and you can only control left and right; and once enough paratroopers (four of them) had landed safely on either side of your gun, they would sabotage your gun, and the game would then be over, although you could also be killed by one of those bombs that the jet fighters drop on you. Also, firing a shell costs one point, and you had the option to use steerable shells, if you so wished. The most important difference to all the rest of the clones must be the fact that you could play Sabotage with a paddle. Other than that, I can't think of any reason that the game couldn't have been released with the same name on all the other computers, because Sierra On-Line went on to release games on pretty much all the 8-bit computers, gradually. Well, the thing is, Greg Kuperberg wasn't apparently one for asking permissions, if his programming history is anything to judge this situation by. He had already made a version of Pac-Man by the name of PC-Man, which was nothing more than a 90-degrees turned version of the classic, and he was yet to make J-Bird, a blatant rip-off of Q*Bert. I have no knowledge one way or another of how and why he came to do these games, but apparently that's all the games he ever programmed. The clone of Sabotage was the second of the three, and was named Paratrooper. For many of us non-Apple fanboys, this was the one and only official Paratrooper, although of course now we know better. The two big differences to Sabotage were the lack of support for paddle controls, and the fact that you didn't have the option to control your bullets. Instead, it had a theme tune, which was a short interpretation of an excerpt from Bach's Toccata and Fugue. The only actual gaming console version of Sabotage was released for the Atari 2600, with yet another different name. At least Commando Raid was different enough to warrant a new title. The two original shooting options are again present, but there is a third option as well, to use automatic fire. You also have an easier option in difficulty, in which you don't have to fight against the bombers. This game is also the first one to have a more colourful backdrop, but it's also the first one that doesn't have all that good playability, since you can't hit the paratroopers themselves - you can only shoot their parachutes. Also, controlling your bullets is a bit awkward. Commando Raid has been made to look more like a mash-up of Missile Command and Sabotage, but ultimately, the buildings around you have little more purpose than keeping the paratroopers from sabotaging your gun for a longer time. It's by no means a perfect example of good progression, but at least it gave some way for the next clones in the line. Another Atari example comes in form of this magazine-released game from 1982, this time for the 8-bit computers. Unfortunately, I couldn't load this game up on my Atari800Win emulator, but I will update the entry if I ever get it working by some other method. The screenshots are taken from Atarimania, apologies/thanks for that. Apparently, this one would be the first conversion of Sabotage since the original game to utilise paddles. 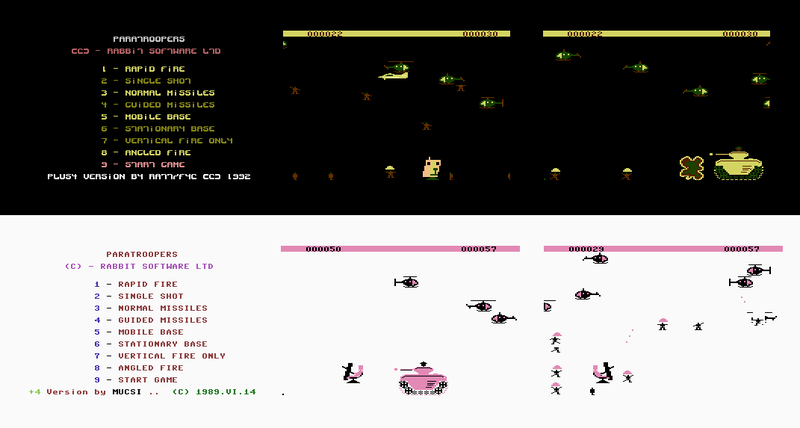 Screenshots from the Spectrum version. Although Rabbit Software released three versions, all three versions bearing the same title were vastly different. 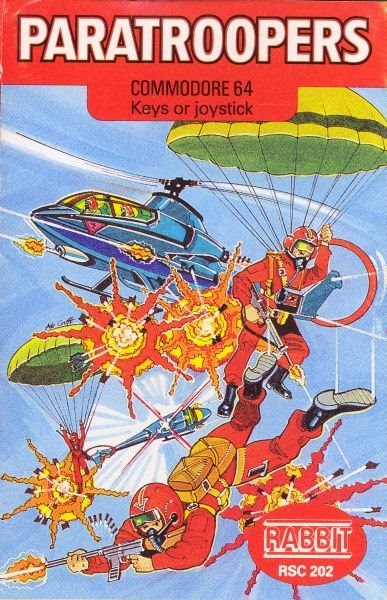 The Spectrum version was more like the DOS version by Greg Kuperberg, with no gameplay specialities whatsoever, except that you could only fire four bullets at a time for whatever reason, and that the limit for successful paratrooper landings was now dropped to three. The game does have some nice graphical additions, such as the first (only?) loading screen for the game ever, and a nice game over animation. The VIC-20 version upped the ante, as it added the possibility of shooting guided bullets, along with the possibility of changing game speed, although you had to choose the speed before loading up the actual game. Not bad, but it wasn't nearly as pretty to look at as either of the other Rabbit versions. Mind you, the title screen says the copyright belongs to The Electric Company, which is a bit mysterious. On the Commodore 64, however, it was like a turbo-boosted version of the old Sabotage, with a few nice firing options, and the most remarkable modification to the idea so far: an option to make your gun base mobile! So, what the Spectrum version added in presentation, the C64 version added in gameplay, but it wasn't all that bad to look at either. One of the first Macintosh computers' earliest games, Jonathan Gay's Airborne! is one of the more advanced ports of Sabotage, featuring not only a different placing of your gun, but also RealSound programming by Eric Zocher - most people will remember it from the rendition of "Ride of the Valkyries" in the opening screen. The playability features are otherwise similar to what the VIC-20 version of Rabbit's Paratroopers has to offer, but looks infinitely prettier, even if it all is in black-and-white format. Strangely, neither of the Atari 8-bit computer conversions I could find was even near to commercial standards, but then again, both versions' main release was in a paper format. The earlier one was released in a book, and this one here was released in a magazine. This looks slightly better, but has joystick controls, so you win some, lose some. It's a very basic version with no other features of intrigue other than the name. Above: 1992 conversion by Ratt / Below: 1989 conversion by Mucsi. 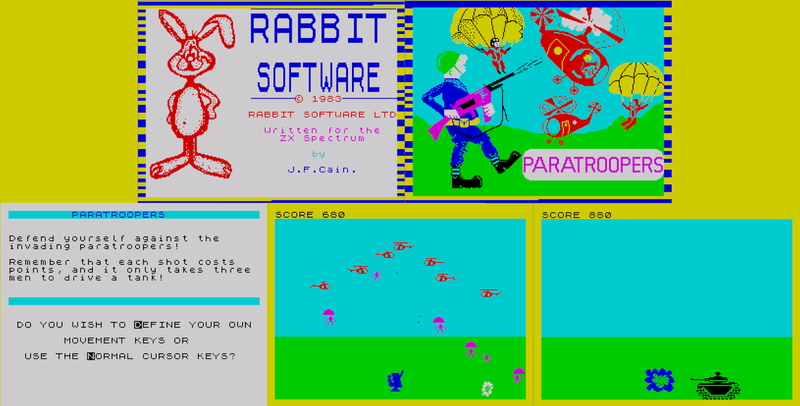 These two unofficial Plus/4 conversions are based on the C64 Paratroopers from Rabbit Software - even the main menu screens still say the copyright is owned by Rabbit Software. And why not, since both of these games are exactly the same game as the C64 version, except for the colouring. Well, there is one difference: you can only play them on the keyboard. Apart from the different colours, the only other difference between these two versions is where to find the fire button. The year of release for this item is currently uncertain - the game itself has the year 1981 mentioned in the title screen, but all the sources on the internet seem to think it's from 1990. If anything, the quality of the game points out more towards the earlier date, but who knows - perhaps it was made by some hobbyist after the actual commercial life of the VIC-20. Anyway, the game is easily the most basic version of this idea ever: you control the gun barrel left and right, and shoot at what should represent the paratroopers, but that's it, really. No helicopters, no jets, no bombs, just asterisks falling down and you trying to aim with a very basic model of the gun, shooting dots. Huzzah. Next up in the line of Sabotage clones is this ridiculously hard to find Apple //gs version by Lane Roathe, whose ParaShooter! was released by Softdisk magazine in 1990. In fact, it's so difficult to find, that I was only able to find some purchaseable Softdisk download packages which cost way too much for me to bother just for this blog entry's sake. Besides, I have no idea whether I would be able to use the contents of the package anyhow, so if anyone can help providing information on this version, please contact me through either my Gmail address or drop a comment below. I could only find a shareware version of this game from the internet, so I can't be entirely certain that what I have to tell you about this game is all that there is to it. The shareware version is graphically and sonically as enhanced a version of Paratrooper as I can imagine it to be - for a 1992 game, that is. This time, the new elements in the game are some new enemies and funny intermission animations, and gameplay-wise, the main difference is the speed of your bullets, which is surprisingly slow. It takes some time getting used to at first, but is more suited for conserving points in the long run, once you get into the rhythm of everything. One could draw the line in time of what should be considered a proper retro game and a retro remake, but since I have no actual idea, where the line should go in this case, I will begin this section from 1995 with Ack-Ack Attack! for the DOS (and PalmOS) machines, by PLBM Games. It has no other specifically unique features, other than a high-score list and a difficulty level setting. Apart from the main menu screen, it even looks as though it was made in 1984 or so. In 1997, two Finnish programmers named Jere Sinisalo and Eppu Wiik wrote AntiParaTroopers (APT) at the Assembly demo party in two days. The big difference to the original concept is that you can play a co-operative two-player game in it. Like in the C64 Paratroopers, your gun is now mobile - in fact, you are both in control of tanks. The full version of the game has two more backgrounds to play on, but unfortunately, Jere is unable to release and distribute the registered version anymore for whatever reason. His small page for the game is here, if you want to have a look. Next up in line would probably be this one: Ganja Farmer by XTreme Games LLC from 1998. So far, even with the shareware version, it's the most entertaining and playable version of the old lot, since it's completely mouse-controlled, and everything has a good pacing. Even the questionable setting makes the experience better. 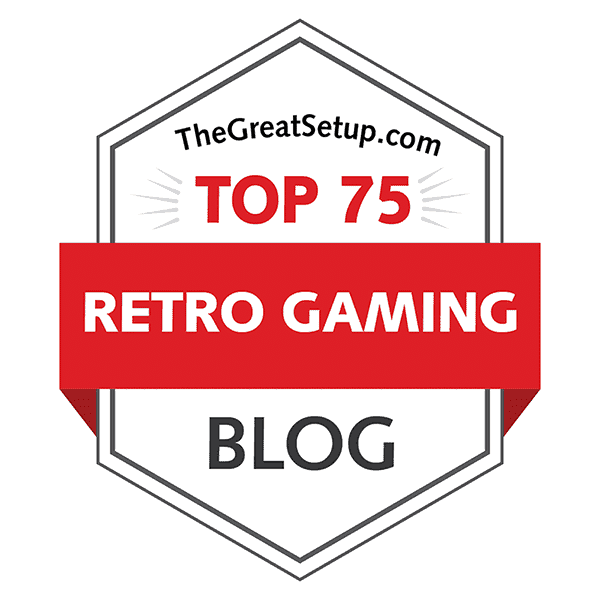 Then, we get to the remakes that would normally be considered too bloody new to mention on this blog, but since this is a special case, let's bend the rules a little. In 2010, Foppy Games released their Manotrooper, first for the Windows PC's, and later for the Mac OS X. The completely unique thing about this game are the dogs, one on either side of your gun, but they aren't really much of help there, as they seem to fall asleep after the first contact with a human. Your shooting speed is slightly quicker than in Night Raid, but it doesn't help much, since you can't really control your gun too well according to your wishes. It controls on the keyboard, but it turns as quickly as the one in Paratrooper, with a smaller fire rate, so it's hard to hit anything, really. The music and graphics are great, but the game is ruined by the playability, which could have been easily saved by mouse control. 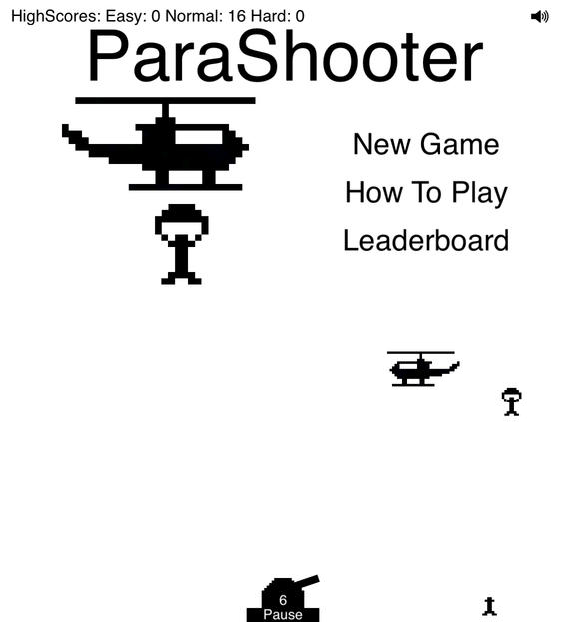 Parashooter at IdenGames.com, by Platon Skedow. Since the original Sabotage, this is the first one that I have come across that utilises analog controls, which would make it the most enjoyable one of the lot by itself, but it also has all the modern features you could think of - different levels, achievements, upgrades, supplies, all that sort. The basic game idea is still very much the same as in the original, as you are in a stationary gun instead of a mobile one, but everything added to it seem to be for the sake of making it more approachable for the modern gamers, and more addicting while at it. As it happens to also be a free game, you cannot go too wrong by trying it out here. Of course Sabotage is the perfect blueprint for making quick browser games or iDevice apps or whatever on whichever modern thingymabob, but the most interesting period for the game's development period is before the age of internet. From the ones made before that time, I think the original Sabotage, as well as C64's Paratroopers and Ganja Farmer for DOS are the most interesting and replayable variations on the same theme. The most readily available, and the most playable version for anyone, is Ragdoll Parashooter, and is highly recommended. This one is available at iTunes app store. If any of you readers have any more good examples of Sabotage/Paratrooper clones in your knowledge, please let me know. Also do tell, if you can provide any information and/or screenshots of ParaShooter! for the Apple //gs. Thank you very much for reading, hope you enjoyed it! Next time, we go back to something more traditional. Nice catch, thanks for the info!